Japan think-tank & consumer marketing research, strategy provider with full fieldwork support . JMR's expertise is in consumer goods marketing research, luxury goods, consumption pattern studies, usability studies for digital products & home electronics, psycho-economic studies, ethnographic and eye-tracking studies. Takebashi Station. on the the Tozai subway line, at Takebashi station, take the 1 B exit , use the elevator or go up a short flight of stairs to the 2nd floor of the Palace Side Bldg to the JMR office. 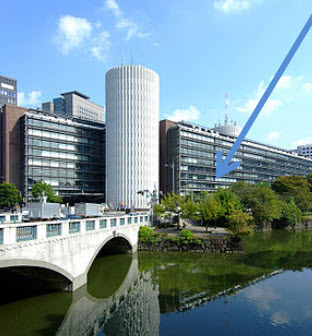 The building is also known as the "Mainichi Shimbun Building. Jimbocho Station. served by 3 lines -- Hanzomon line, Toei Shinjuku line, and Mita line. take the A 8 exit and walk about 5 minutes toward the Imperial Palace. Ask driver to go to "mai-nichi shimbun biru" or also know as the "palace side biru"
Landmarks are the "Hitotsubashi intersection", the "Maiichi Shimbun building" , the Imperial Palace. A map in Japanese to print and show a taxi driver can be downloaded here. Take a taxi or the subway Tozai Line to Takebashi station. Copyright (c) 1997-2019 Japan Consumer Marketing Research Institute. All rights reserved.